And reviewed by the U.S. military, a soldier stands guard at the front gate entrance to Guantanamo's Camp 6 maximum-security detention facility, at Guantanamo Bay U.S. Naval Base, Cuba. MIAMI (AP) — Six prisoners held for 12 years at Guantanamo Bay have been sent to Uruguay to be resettled as refugees, the U.S. government announced Sunday — a deal that had been delayed for months by security concerns at the Pentagon and political considerations in the South American country. Uruguayan President Jose Mujica agreed to accept the men as a humanitarian gesture and said they would be given help getting established in a country with a small Muslim population. "We are very grateful to Uruguay for this important humanitarian action, and to President Mujica for his strong leadership in providing a home for individuals who cannot return to their own countries," U.S. State Department envoy Clifford Sloan said. The Pentagon identified the other Syrians sent to Uruguay on Saturday as Ali Husain Shaaban, 32; Ahmed Adnan Ajuri, 37; and Abdelahdi Faraj, 39. Also released were Palestinian prisoner Mohammed Abdullah Taha Mattan, 35, and 49-year-old Adel bin Muhammad El Ouerghi of Tunisia. Uruguayan officials declined comment Sunday on the transfers. Adriana Ramos, a receptionist at a military hospital in Montevideo, the capital, said the six men were being examined there but declined to provide any details. Cori Crider, a lawyer for Dhiab from the human rights group Reprieve, praised Mujica, a former political prisoner himself, for accepting the men. "Despite years of suffering, Mr. Dhiab is focused on building a positive future for himself in Uruguay," said Crider, who was heading to Montevideo to meet with him. "He looks forward to being reunited with his family and beginning his life again." Obama administration officials had been frustrated that the transfer took so long, blaming outgoing Defense Secretary Chuck Hagel for not approving the move sooner. They said after Mujica had agreed to take the men in January, the deal sat for months on Hagel's desk, awaiting his signature as required by law. The Pentagon didn't send the notification of the transfer to Congress until July. The slow pace of releases has created a tense atmosphere inside the prison. A hunger strike that began in February 2013 totaled about 100 prisoners at its peak, including Dhiab and Faraj. 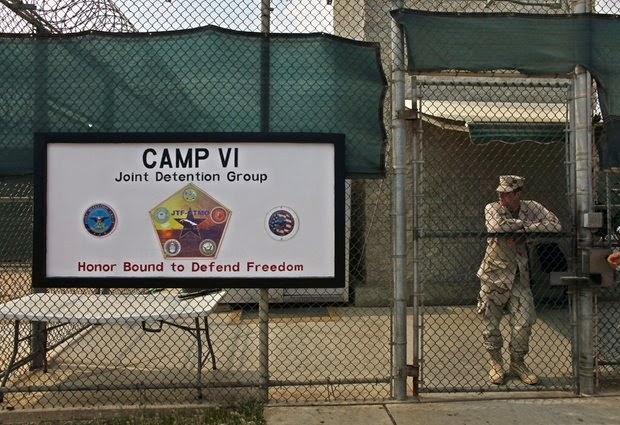 The U.S. now holds 67 men at Guantanamo who have been cleared for release or transfer but, like the six sent to Uruguay, can't go home because they might face persecution, a lack of security or some other reason.